I have now, for many years, been searching for the perfect Rosh Hashanah cake: something not overly sweet, something, perhaps, featuring apples, something festive enough for a crowd but simple enough for a quiet breakfast the following morning. And while searching for the perfect apple cake didn’t sound like much of a challenge, I can assure you that it was. My family didn’t have a traditional apple cake for the holiday – I was on my own on this one. In my seemingly endless search, I became the Goldilocks of Rosh Hashanah cakes. This one was too sweet; that one – not sweet enough; the third – too dense. I experimented with a few, got some favorable results, but nothing struck me as the cake that I want to serve at the end of a Rosh Hashanah meal or for the holiday brunch. I wasn’t in love. What I wanted, specifically, were a few things. Appliness, for one, was key criteria. I wanted a moist, delicate coffee cake that was big on fall flavors: apples and spice. I wanted the cake to declare, “Fall is here; forget summer.” You would think that it would be easy, saying hello to my favorite season, but with summer’s end, a certain melancholy creeps into my heart. This summer in particular went by so fast, I didn’t even get a chance to say goodbye. So last night, for shits and giggles, I made a tally of things I meant to cook this summer and never got around to. Number of tomato sandwiches made – zero. Is that not crazy? There was a lot of pasta con pomodoro crudo, but guess what? I failed to photograph any of it half a dozen times I’d made it, so there’s that. There were grandiose plans to brine watermelon a la Russe. Man, it is such good snacking, that I really owe you on that one. Next summer, I promise. First of the season watermelon will go only for such purposes and will not, I repeat, will not be sliced and eaten cold just as is. Perhaps my most shameful failure of the summer is sour cherry vareniki. Sour cherries, as you know, have the shortest season. Blink, and you miss it. This year, the season was even shorter thanks to a winter that held on for dear life, and a very wet spring. But I was not to be stopped. I marched to our local farmers’ market and bought thirty dollars (!) in sour cherries. I then spent one long and boring evening pitting said cherries, dividing them among individual bags and freezing them, supposedly for future use. I was going to make sour cherry dumplings, aka sour cherry vareniki. And I did, sort of, make one unattractive bunch and was going to get to the rest. But sour cherries were already (already!) gone! And vareniki, much as I love them, do take a long time to make, and personally I was not big on spending a lot of time indoors this summer. So, I now have some vareniki pictures sitting on my hard drive, but what good is a sour cherry dumpling to your now? In September? You tell me. But I wasn’t going to fail like this for Rosh Hashanah. In the last few weeks, I’ve baked nearly half a dozen different apple cakes. And by half a dozen I mean, a few iterations of each with variations. None made me really, truly, completely happy. I wasn’t looking for flaws, I was just looking for the fall coffee cake idyll. I was beginning to doubt myself and wonder if that even existed in my universe of tasty things to eat. Enter Merrill Stubbs and the ever-excellent Food 52. 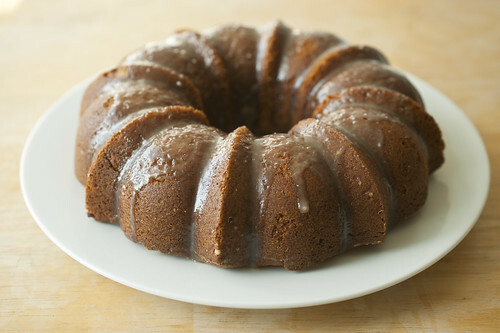 When I spied this cake on the interwebs, I just knew this was it: Using applesauce was just brilliant. Firstly, I always have a giant vat of it sitting around in the fall, and finding different uses for it: from glazing meat, to adding it to pot roasts, to eating it plain, to, clearly, adding it to cake. The applesauce takes on double duty here. First, it gives the cake that perfect level of moisture without bordering on wetness – you know what I’m talking about. And second – it is as autumnal as cakes get, aided by a generous helping of spices. That cinnamon – it is not being coy. The cake just might be the perfect antidote for the week of rain we’re getting here in the Northeast. And the caramel glaze, while totally ethereal and seals the deal (in my book anyway), is entirely optional. The cake is stunning without it, although it’s so good with it, that I wound up licking the spilled-over glaze that dripped onto the foil while I was drizzling the cake. I brought this cake to a ladies’ dinner in, hosted by the best fried chicken maker this side of the border, Jennie, and the ladies loved it. Jennie even ate the crumbs. So my plan is, come Rosh Hashanah next week, is to make two cakes: one without the glaze, to serve after a dinner of brisket and potatoes; and the other, generously glazed – for the lox and bagels brunch the following morning. That way, I can keep things kosher for the holiday, have my cake(s) and eat it? them? too. 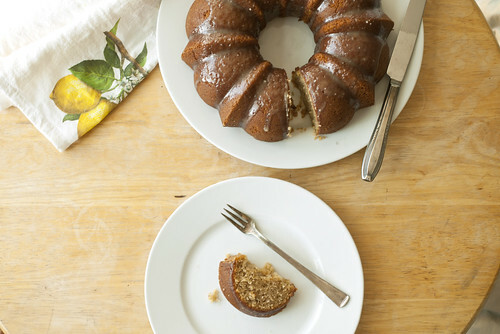 A cup of coffee and a slice of this applesauce cake just might make me forget about my summer shortcomings. Merrill’s recipe is perfect as is. So you can reference her and make it just as she had. I tweaked a few things though, subbing in 1/2 cup of whole wheat pastry flour (I like to feel somewhat virtuous eating my baked goods and am excellent and deluding myself that now, that I’ve added some whole wheat flour, this is now the equivalent of a nutrition bar.) Also, I used baking powder instead of baking soda (mostly because I failed to read the recipe right), but it was a happy accident. Finally, instead of vegetable oil, which I’ve found mostly just meh on flavor, I used a mild extra-virgin olive oil here. You don’t need to go for your finest, most flavorful oil. A gently scented one, that’s not expensive, should do just fine. You’ll love the added flavor, I promise. 1. Heat the oven to 350 degrees F (177 degrees C), and butter and flour a 12-cup Bundt pan. Sift together the flours, baking powder, salt, pepper and spices and set aside. In a large mixing bowl or the bowl of a standing mixer, on medium speed, beat the eggs with both sugars until light, 2 minutes. Set the mixer to slow speed and mix in the applesauce, oil and vanilla until smooth. 2. 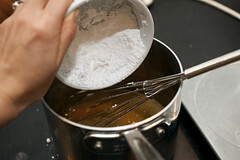 Using a silicone spatula, fold in the dry ingredients, being careful not to over-mix. Pour the batter into the prepared pan and bake for about 45 minutes (check on the cake after 35 to be sure), or until a cake tester inserted in the center of the cake comes out clean. 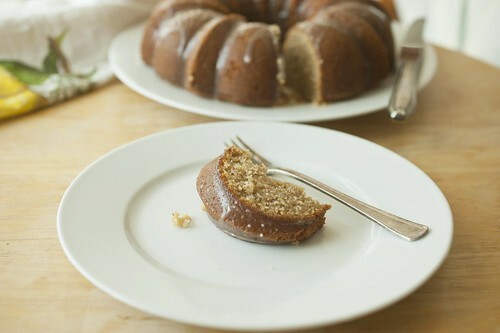 Cool the cake for 10 minutes in the pan on a rack before turning it out and cooling completely on the rack – make sure the cake is not at all warm before you make the glaze. 3. Put a piece of foil or parchment paper under the cooling rack to catch any drips before you start the glaze. 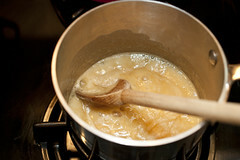 Put the butter in a medium saucepan with the brown sugar, cream and salt and set over medium heat. Bring to a full rolling boil, stirring constantly, and boil for one minute exactly, and then pull it off the heat. 4. Leave the pan to cool for a couple of minutes, and then gradually whisk in the powdered sugar until you have a thick, but pourable consistency (you may not need all the sugar, you might need a bit more). If the mixture seems too thick, just add a splash of cream to thin it out a little. Immediately pour the glaze over the cake, moving slowly and evenly to cover as much surface area as possible. Let the glaze set before serving the cake. O, this looks awesome! I have been engaging in a similar search (although not quite as intensely as you of course!) for a non-dairy, rosh hashanah themed dessert to serve for the holiday and I have come up short everytime … and here you come along with the solution to all my High Holiday queries! I can’t wait to try it! Sorry about all the things you didn’t get to do this summer…maybe there’s still time for a tomato sandwich or two? I will be making this beautiful cake for Rosh Hashanah! I make an applesauce cake that has been in my family for generations, but I have been looking for a new topping for it lately. 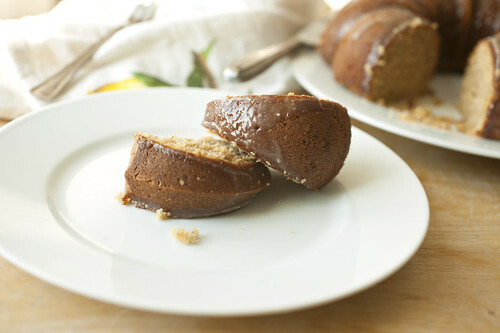 The traditional one sets up really fast, so there is no way to drizzle it on a Bundt style cake. Love the idea of the caramel glaze–thanks! I am thrilled to see your apple cake! Every year, I try a new apple cake recipe for Rosh Hashanah in search of “the one”. Can’t wait to make this one! I like your addition of whole wheat pastry flour (always good for rationalizing cake) and the caramel glaze looks divine. I really enjoy reading your blog! Wishing a sweet and healthy new year to you! The goldilocks of Rosh Hashanah cakes — ha! I just went through a sticky spate of testing apple-n-honey recipes, and there’s always that need to get things *just* right for a holiday. This cake looks lovely. Summer does that to me EVERY year! I was especially bad this year. After starting what I want to be a tradition last summer – canning 12 qts of whole/crushed tomatoes, I didn’t get any done this summer. It flew by too, too quickly. It sure looks like you’ve found it! Looks tasty!!! What a beautiful cake! I love that glaze. This is one great cake! The glaze is absolutely scrumptious and after only one day, it’s almost all gone! YUMMY! oh, you dear, sweet thing! 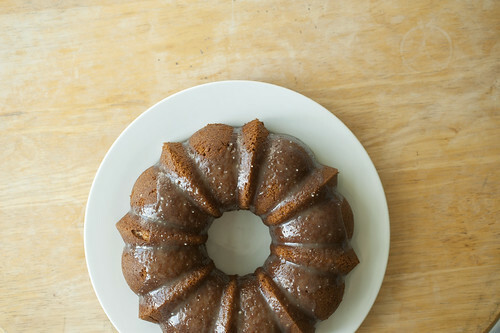 i’ve been trying to channel an applesauce cake right through my screen all week. ah-ha! found. dear 50# of apples sitting in baskets around my house: beware. your fate is sealed. and it’s dripping with caramel. This recipe rocks, I love the cake, I tried this at home and found that it is very easy to bake such. very elegant Rosh Hashanah idea! I love the use of olive oil. I have this in the oven right now! I’m so excited!